Recent research suggests that the use of antibiotics as a treatment for the common ear infections seen in many young children might not prove to have any beneficial value. 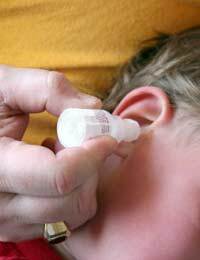 Suffering from an occasional ear infection is a very common occurrence in children. It is normally the middle ear that is affected and often a fluid build-up can occur in the middle ear area. Studies have shown that the use of antibiotics in children with ear infections does not make any significant change to the fluid build-up that may occur.Previous concern suggested that the build-up of fluid may risk the eardrum becoming perforated as the pressure intensified or that it may contribute to speech and language problems, but the recent evidence has shown that these conditions are likely to clear up on their own within a few days.Most parents visit their doctor to seek an appropriate treatment, usually antibiotics, but these drugs are now being used with caution in children over the age of two as it has been found that most ear infections will clear without the need of medical interventions that may cause some unpleasant side-effects.It used to be common practice for doctors to prescribe at least five days of antibiotics, sometimes longer in chronic or recurring infections but evidence has now suggested that this is not an effective regime. What Are The Side-Effects Of Antibiotics? It is common to experience bouts of diarrhoea from taking antibiotics or to have episodes of nausea and vomiting; these effects can be managed but are unpleasant. More worryingly is the more dangerous effects such as allergic reaction, or building up a resistance to the drugs causing new bacteria to become resilient to the treatments rendering them ineffective.It is also possible that the infection is caused by a viral infection in which case antibiotics will be ineffective and taken unnecessarily. What To Do If Your Child Has An Ear Infection. If your child is over two years of age, it is now advised to wait at least two days before seeking help. Quite often the infection will clear up in this time and prevent then need for unnecessary medication usage.Make sure your child is taking plenty of water and resting during this period. You may find that your child has a slight temperature with the infection and this can be treated using paracetamol preparations given as directed which will also help to reduce pain and discomfort.If the infection continues for longer than two to three days or starts producing a discharge from the ear then go and see your GP.If your child has a temperature that increases even with the use of paracetamol, then seek medical advice also.Children under two should have an ear infection treated when it first arises as they are more at risk of developing a high temperature which can be dangerous in this age group. Ear infections in children are very common and usually not serious and antibiotic therapy is no longer recommended unless the symptoms worsen or the infection is prolonged.